The most important thing to keep in mind about Mutant Year Zero: Road to Eden is that you can’t just run up to a group of enemies, take them on, and expect to come out of the encounter alive. Doing this means you will be crushed. Over and over and over again. Instead you must learn to use stealth and plan your major attack in detail. 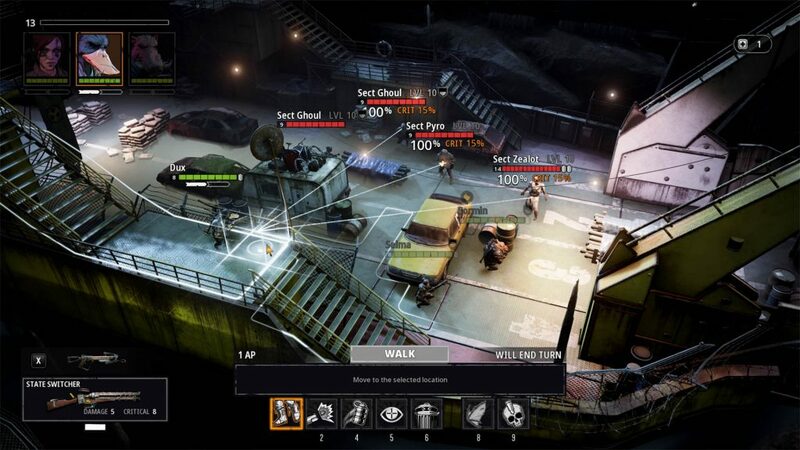 The tactical combat follows many of the rules from similar games (like XCOM) – you have two actions per round, shooting ends your turn, you can learn special abilities, you can overwatch etc – but there are many other factors you must keep in mind. The main difference you notice in Mutant Year Zero: Road to Eden, compared to most other tactical games, is the importance of stealth. The obvious part is that you can take out single targets stealthily, while not alerting the rest of your enemies. The hard part of this is being able to deal enough damage, using just silent weapons, in just one round. Because if the enemy survives that round he will call out to his friends for help. So, the key to increasing your damage with silent weapons is to upgrade them and use Mutations. Skull Splitter for example, allows you to get a 100% critical chance, but you take a 25% penalty to hit. Walk right up to the enemy you wish to take out silently – don’t worry about him noticing you, as he can only call out on his own turn – and use Skull Splitter at point blank range. Another mutation you can use is Silent Assassin. It doubles the critical chance of a hidden mutant. Use this mutation after you have ambushed your target, but don’t move so close that he can see you. You are still hidden, and with this passive Mutation active you will have a very high critical chance. The difference between being able to take out a specific enemy or not silently, can easily be the difference between life and death. Every single point of damage you can do silently matters. You can only have three Mutants active in your team at any time. This makes each of their actions incredibly valuable. If you constantly have to move your Mutants to find cover or spend their actions on healing each other, you are wasting precious time which could be used to activate Mutations, throwing grenades, reloading or shooting. Some of the best weapons in the game have to be reloaded each turn. This means you can’t afford to shoot that turn if you have moved. You lose close to half your damage output in a turn when you can’t shoot your most high-powered weapon. 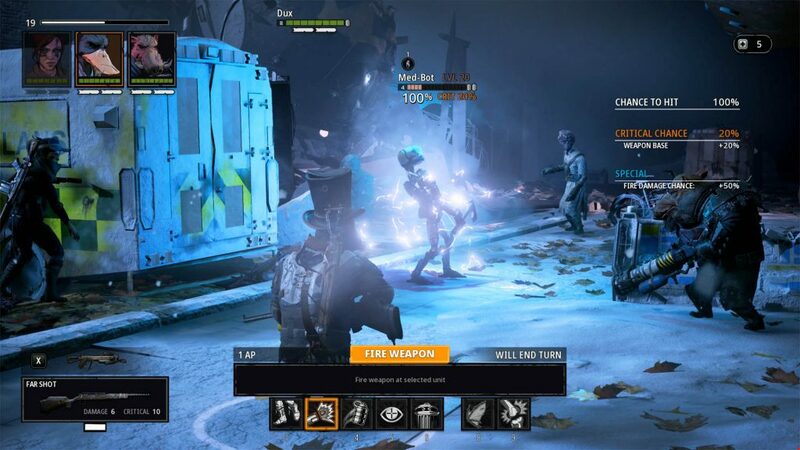 This makes positioning and controlling the battlefield even more important in Mutant Year Zero: Road to Eden than most turn-based tactical games. You must make sure all three of your Mutants are able to shoot as close to every turn as possible, without taking much damage in return. Losing one team mate in a team of five is bad but losing one in a team of three is crippling. So, you must keep the pressure up on your enemies, killing at least one of them per turn. If not, you run the risk of being overrun very quickly. To be able to keep the momentum up and fight the battle on your terms you must find the best spot to attack from. Choosing the battleground carefully can make the difference between victory and defeat. Lots of cover is an obvious advantage and another is being able to find high-ground. Shooting from high-ground has an innate bonus to hit chance, but more importantly certain passive Mutations and gear give you very high critical hit chances from high ground (like the Mutation Alpinist). Another thing to keep in mind is the range of your weapons and how many enemies are around you. Your gunshots will sometimes alert huge groups of enemies and a good strategy in these situations is to setup in a well-protected corner of the map and let the enemy run at your position. If you for example have two out of three team-members on high ground with the Alpinist passive mutation, while the third does crowd control and some tanking down on the ground, you will be able to deal huge amounts of damage. With a good defensive setup like this you can often rain down two or more critical hits per turn. Each of your Mutants can develop many Mutations as you play through the game. You will be able to “equip” one passive and two active Mutations per team-member but can swap them out for new ones between each battle. Some of the most important Mutations you can have are the ones that disable your enemies. When a horde of enemies come charging, like a pack of ravenous Zone Dogs, the Treehugger Mutation can be incredibly powerful. It roots enemies in a certain area for one round. Combine this with a well-timed Molotov cocktail into the pack, and they will be set on fire and will take damage each round. Another disabling Mutation is Bormin’s Hog Rush. With it you can run into an enemy and knock it to the ground for one round. This can be invaluable, because knocked down enemies can’t call for help and the ability to knock out certain strong enemies for one round, like the Nova Sect mind-controllers, can be the difference between victory and defeat. You will have five different Mutants to choose from, so you should experiment with different combinations that you feel work. Different kinds of enemies also require different kinds of responses. Mutant Year Zero: Road to Eden gives you a host of choices and many strong encounters. Your biggest challenge may still be to “unlearn” what you have learned from other tactical games – because this game takes turn-based tactics to another level. If you don’t adapt you will not last long. ← Xbox Game Pass and 14 Minute Gameplay video with developer commentary!